One of the most remarkable women of the Eighteenth and Nineteenth centuries. Madame Jumel rises from her birth in a brothel in Providence, Rhode Island, to become the wealthiest woman in the United States with a zelig ability to appear in many of the historically important moments of her ninety year life. The personification of Madame Jumel began with the replica of the only dress we know to exist at The Museum of The City of New York Collections. The dress was measured, patterned and recreated in materials as close to the original as possible. The waist, bust and proportions are that of Madame Jumel in the late 1850’s. The bas is a stack of books representing those in the Morris-Jumel Mansion archives in French that we presume to have belonged to Stephen Jumel dyed in coffee. Her bodice is three corsets layered over one another. The first a small brown corset on the inside is that of a ten year old girl in the 1780’s haolding dried plants. Herbs and flowers. 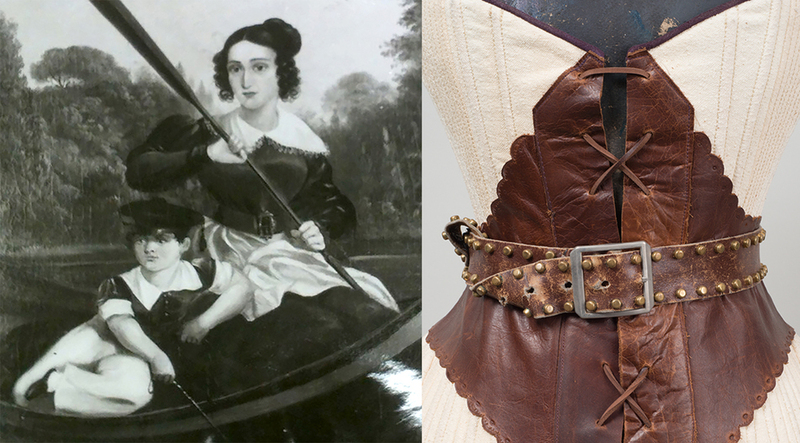 The red velvet corset is that of someone in the late 1790’s when Eliza Bowen would have been walking the streets of Providence with a monkey perched on her shoulder. The replica boned bodice in yellow silk is pinned open to reveal the other two corsets represents the material and mercenary achievement she spoiled for all her life. dried plant manner. Base realized by Lucia Del Sanchez. Fourteen months after her first husband's death, she married the controversial former United States Vice President, Aaron Burr. She married to increase her social stature; he, for access to her fortune. Burr in turn, squanders the money, a poisonous court battle ensues and the two divorce on September 14, 1836, the day of Burr's death. Madame Jumel lives the rest of her life in the Manhattan mansion, earning sufficient reputation as an eccentric to be thought to have inspired Charles Dickens’ Miss Havisham in Great Expectations. She dies at age 90 in 1865 and is buried in Manhattan at the Trinity Church Cemetery and Mausoleum. co-respondent as someone whose provenance would flatter. and policies toward property rights and suffrage became the ballast of his Tammany Society and the basis for safeguarding their rights, and the rights of the common Revolutionary soldier, her father for instance, from their removal by Alexander Hamilton and the Federalists. And she liked that. While Jane never emphasized her race in print, it was a likely source of her ambitions. In 1831, she and Burr were working together toward the McManus family acquiring large patents of land in Mexican Texas. Advocating alongside Burr for the annexation of Mexico, she and her family proceeded to buy and attempted to settle the disputed territory with indentured immigrants and free blacks. Jane's financial partner backs out leaving her to seek funds from other investors, Burr amongst. his wardrobe strewn into a snow bank. of adultery, choosing Alexander Hamilton, Jr. as her counsel, Jane McManus as Co-respondent, and using Burr's own servant as the incriminating witness against him. Eliza turns accusations against Jane into the kind of slander Hamilton's father aimed at Burr, who she will accuse of robbing her money. The Divorce decree becomes final the very day of Burr's death. Madame Jumel would use Burr's name as a matter of convenience when it suited her ends. Jane McManus, publicly humiliated and thwarted in her pioneering of Texas, took a dozen journalistic pen names toward regaining an economic footing. Her writing career embraced the revolutions in the Caribbean, Central America and Mexico and advocated American annexation. Writing for The New Yorker, The Daily Plebeian, The Workingman’s Advocate The New York Sun and The Democratic Review, about the expansion of commerce and democracy, she alternately urged African Americans to move further South toward escaping the obdurate racism of North America. Democratic Jane would coin the term Manifest Destiny to characterize the annexation and filibustering that ultimately would create the contours of the American West, while her Tory opposition would restyle Manifest Destiny into an Imperialism profiteering from the gruesome genocide of very indigenous American people Jane McManus had been seeking to empower. Storm Cazneau. Austin: Texas State Historical Association, 2001.
to follow both design and historic research as she explores biographical narrative. very chic Angelica Schuyler Church, who in turn infers his having an intimate “confidential” relationship with the British intelligence agent, Major George Beckwith – who, with Major Andre, is known for facilitating the treason of General Benedict Arnold. in question he’s paid to the Reynolds was sexual blackmail. In this he attempts to compensate the cuckold, cover up his affair with Mrs. Reynolds, and divert attention from his wife’s family’s finances. When things get ugly, Hamilton challenges Monroe to a duel, requiring Burr to intervene, diffusing the situation, effecting Maria’s divorce from her husband becoming her consolation and Hamilton’s nemesis. The story goes that what Hamilton had to pay Maria for… Burr was given freely. The one-sided animosity likely began as New York’s Clinton faction elected Burr to the Senate over Hamilton’s father-in-law, Philip Schuyler. taken to the extraordinary extreme of an entire needlepoint sofa. Noah Webster on Alexander Hamilton. The end of their Affair was the beginning of the end for Hamilton. By contrast, Burr was the sort of friend to Maria who financed her children’s educations. The corset of Maria Reynolds is ablaze in red and gold paper cast over the figure and fabric. The letters are few as what we have attributed to her are forgeries in Hamilton’s hand. The armature is copper and plastic with string.